Changes in the preferences of Chinese travelers who appear to be choosing destinations like Greece and Italy and France instead of Britain reflects recent research in the Pacific . The survey was conducted by website Travelzoo ( listed company in the stock of the New York Nasdaq ) , was completed at the end and the findings meant ” bell ” in the tourist world of Great Britain as it shows that , despite the efforts of the British, the Chinese seem to prefer other tourist destinations . The promoters Travelzoo estimate that the lost revenue of the United Kingdom from the inability to attract more Chinese visitors than 1 billion pounds (1.2 billion euros) a year. The interest in Greece is that , according to the same survey , the Chinese will make this year more trips abroad are estimated to spend an average of £ 5,000 ( 6,000 Euros ) . 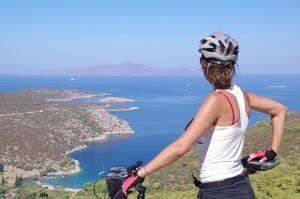 Tourists will now know exactly what to look for in the stunning destinations of Cretan while cycling. The Municipality of Hersonissos recently produced a new brochure for bike tours to give cyclists all they need to know about the locale on their bikes. Hersonissos_Biking_RoutesThe brochure presents nine biking trails for all difficulty levels accompanied by maps, photos and other useful information so bike riders can combine cycling with visits to traditional villages, landmarks, archaeological sites and monasteries. The brochure will assist visitors to experience the beauty of nature, tradition, history and the hospitality of the residents of Hersonissos. Cycling tourism is an emerging form of quality tourism, which allows travelers to combine a holiday with sport and allows for a better understanding of a destination’s surroundings, sights and nature. Hersonissos is among Greece’s most popular tourism destinations with favorable weather conditions for cyclists and excellently combine sea and mountain, culture, history and tradition. The new brochure on bike tours is the first of a series of brochures launched within the context of the municipality’s actions for sustainable tourism development. The brochures aim to promote the various thematic tourism options visitors will find during a vacation in Hersonissos. Acropolis Museum One of Top 5 Restaurants! The Acropolis Museum is one of the Top 5 places to eat according to “Toronto Star,” one of the most well read Canadian newspapers! Chinese developers have been purchasing big real estate projects in the world’s most important cities in the past year. They will continue the shopping spree this year, with other Chinese groups to follow the trend soon, according to real estate analysts. 2013 has been a positive year for Greece considering the debt-mountain it had to climb at the beginning of the year. However, it could have been a more fruitful year if the country’s court of auditors had not intervened in the sale of almost 30 state assets to a couple of companies based in Athens. The country had targeted selloffs worth 1.3 billion for 2013, and despite promising signs of accomplishing its goal, Greece fell short. Greece has a rescue package worth 240 billion euros, and the sale of state assets forms a key component of the package. However, the debt-laden economy has thus far encountered several different setbacks forcing it to twice lower its target for privatisation proceeds in 2013. The main reason for its failure is identified as DEPA’s (Natural gas firm) inability to receive any attractive bids. Real estate insiders have revealed that a number of “technical issues” regarding the sale of 28 state assets were raised by the court of auditors, but there was hope that the matter would soon be resolved. The HRADF privatisation firm was set to appeal against the court for blocking a deal which was expected to collect more than 260 million euros. Over the past year, Greece has raised 960 million euros owing to privatisation proceeds, as confirmed by budget figures released by the state. The 261 million euros that were supposed to come in through the sale of 28 state assets would have helped the country clear its target, but it did not materialise, leaving Greece in a troublesome state already having lowered the target twice. Ethniki Pangaia – a real estate firm and Eurobank Properties were chosen in October 2013 as the bidders most preferred for the transaction which the state had originally intended to seal by the end of the year. Both companies continue to attract hundreds of millions of euros from overseas investors at the moment, with Invel Real Estate – a private equity firm and Fairfax Financial Holdings – a Canadian investor responsible for a large part of its income. The privatisation deals signed by Athens since 2011 are worth around 3.8 billion euros, raising around 2.6 billion euros in cash in total. Since Greece had to seek a bailout following an economic downfall earlier in the decade, the country’s international lenders – the International Monetary Fund and the European Union demanded the implementation of an asset sale program. However, both organisations suffered a massive blow when DEPA failed to attract any concrete bids after Gazprom – the biggest gas producer in the world hailing from Russia, as well as the frontrunners to complete the purchase withdrew during the final stages. The nation has made plans to offload DEP again in 2014. However, market analysts are sceptical about the sale, fearing that it may not be completed due to the European Union’s regulatory obstacles and lack of investor confidence. In a meeting organized by the Greece’s Prime Minister Antonis Samaras and representatives of the Association of Greek Tourism Enterprises (SETE) and other tourism professionals the Greek government and the tourism professionals are realizing the importance of tourism for improving the country’s economy. The tourism industry will play a vital role in improving the countries tourism so the government has decided to put a greater thrust on this industry. In 2013 Greece welcomed 17.8 million arrivals and registered an all-time record in revenues of 12.5 billion euros. Speaking to the press the Greek Tourism Minister Olga Kefalogianni said 2013 was a very good year for Greek tourism and that next year she anticipates an even better season. The initial messages for 2014 are positive and encourage that Greece should expect more revenue and jobs, which will give a boost to the country’s economy. E also added that since last year Greece regained its credibility in the global tourism market and changed its image abroad in addition to the great success in terms of arrivals and revenue. He said that the government is laying more emphasis on tourism and is trying to attract investment by enriching tourism products and with new products like medical and religious tourism. He is quite sure that with these positive endeavors Greek tourism will find its place in the global tourism market. Greece can see a record year in tourism this year if the political stability is maintained felt the president of the Association of Greek Tourism Enterprises, Andreas Andreadis. In 2014, Mr. Andreadis expects arrivals to surpass 18.5 million, direct revenue to add up to 13 billion euros and 50,000 jobs to be created. He said the main target is for Greece to attract 24 million arrivals by 2021 along with 48 billion euros in total revenue and 300,000 jobs. 2014 is expected to be a better year for Greek Tourism said president of the Hellenic Chamber of Hotels, Yiorgos Tsakiris if political condition of the country is stable. During the meeting, Mr. Tsakiris suggested the further improvement of the Greek tourism product with actions on the standards of medical tourism and the Greek Breakfast initiative. He also underlined the importance of upgrading the country’s hotel services, defining a new development model for tourism and he also stressed the need for further resources to be invested in Greece’s tourism promotion. The Labor Minister Yiannis Vroutsis said the increase in tourism in 2014 would boost unemployment while Culture Minister Panos Panagiotopoulos announced the Culture Ministry’s intention to extend the hours of 30 of Greece’s most visited archaeological sites and museums from 8am to 8pm. The Greek Tourism Ministry announced on 8 January 2014 that the history and archaeology graduates will now get a “fast learning” program which will provide them with a tour guides certification. This program will start from February 2014 in Thessaloniki. The program will be held from 17 February 2014 to 17 April 2014 at the Aristotle University of Thessaloniki (also known as the Aristotelian University or University of Thessaloniki). A fee will be charged to those attending the program. The amount will depend on the number of persons attending. Further information on the program may be obtained (in Greek) from the website of the Aristotle University. Vacations allow people to relax and enjoy time with family and friends at some attractive places, such as exotic beaches, amazing mountains and any other serene location. Fretting over any sort of vacation rental scam is the last thing you want to experience. However, vacation rental scams are a reality. If you are a gullible customer, please be ware there are lots of websites with enticing offers on vacation properties that can easily make you a victim of scams. Most of the scammers follow the basic technique of listing fake advertisements of vacation homes with compelling prices that can catch attention. The photos and description of the property in the advertisements are usually lifted from a legitimate property website. In some cases the address posted in the advertisement may not exist at all. It could also be the address of a property that is not meant to be for rent. Sometimes it may even be a fake rental description invented by the scammers. Such forged advertisements are not only shown in online classified websites like Craigslist or EBay but are also visible on online chat boards, newspapers and fake property websites created intentionally to cheat online visitors. The main goal of the fraudsters’ and the fake vacation rental advertisement is to extract an up-front payment from those who are interested in the offer. Furthermore, they can also steal identities by asking the curious visitors to submit personal information through an application form. Everything from the transaction payment gateway to the rental agreement and collecting keys seems legitimate, but once the payment is done, then you will know that it was a scam. Sometimes, you may not know about it until you are on your vacation with your family and visit the given address of the rental. Such scams are mostly used for targeting long-term rentals in college towns or localities well-known for retired people and targets audiences such as parents of college students and others looking to cut down rental expenses. One source of these ads are owners of a property that is about to be foreclosed trying attract ignorant renters who come to know the reality only when it is seized. Another source revolves around homes that have been vacant for months as the real owners stay away. These are used to target people who are looking for a lease. To keep away from such fraud, using common sense and online research is imperative. If a verification process is allowed by the vacation rental companies then go for it. The inquiry can help you become aware of the red flags and stay away from the scammers. If the rental offer is an online advertisement with description and photos, then find out whether the content or photos are copied from some renowned property website. If the search results show some copied content from some other rental descriptions, then put a red flag as it can be a scam. Search engine maps are also helpful as you can find aerial views or even street level images of the property. Browse vacation rental ads only at listing websites that have track records against phishing or any other scams. However, phishing schemes can steal your personal information through emails, so experts suggest using proper filters to avoid suspicious emails that mostly demonstrate poor English. Relying completely on email communication is not a good idea, as most of the rental scams are carried out through emails. If you want to consider phone calls, don’t overlook suspicious foreign or distant area codes. Don’t choose debit cards or wire transfers as a payment mode. Instead opt for credit cards as you stop a payment and report the fraudulent transaction. Ask for proof of ownership from the owner of the property to cross check the information with assessor’s office of the rental location. While dealing with agents, check whether they have authorization to sign the lease on the owner’s behalf. Confirm it with the owner. Check the credentials of real estate agents by searching in the licensing office of the agent’s state and verify the information with the information provided by the advertiser.